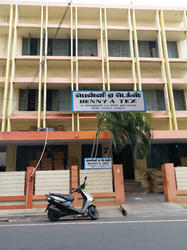 We "Benny A Tex" began our operations in the year of 2007, are a trustworthy and prominent manufacturer, exporter and supplier of this impeccable array of Textiles Products. Under this quality approved collection we are offering to our clients Bath Linen, Out Door - Linen, Bed Room Linen, In Door Linen, Kitchen Linen, Cotton Bed sheets and Kitchen Apron. These products are fabricated by considering only best quality raw material. Our offered products are broadly admired in the market for their attractive designs and patterns. To meet the varied requirements of our clients in best possible manner, we are offering our products in a wide collection of sizes. The product range we offer are used in homes and hotels. We are exporting globally. We have developed a well designed and developed infrastructural set at our premise across a vast area of land. Equipped with all the desired machines and tools, our manufacturing unit is able to design the products in such a production rate that we are able to cater the bulk demands of our offerings. For this purpose, we have recruited a team of talented and skilled professionals. Our professionals having rich knowledge in this domain and possess vast experience in this industry. To achieve the well defined organizational goal in timely manner, our professionals are working in close coordination with each other and clients too. Under the constant supervision of our mentor "M. Thamil Selvi", we have been able to achieve such a distinct position in this domain. Due to his motivation and valuable direction, we have attained a huge number of clients across the nation. Manufacturing and Trading of Home Textiles and Garments. Our organization has one of the leading names in the market for offering superior quality designer bedsheet. These products are widely appreciated and demanded across the market for their colors, shapes, designs and patterns. At our organization, we have established a spacious workspace that supports us in the flawlessness manufacture and storage for the proposed array of designer bedsheet. We have divided our infrastructure into many units.